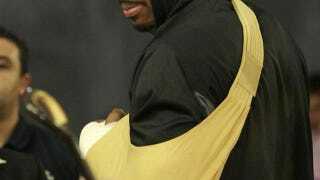 Was Amar'e Stoudemire's Hand Injury Caused By The Compressed Season? Knicks forward Amar'e Stoudemire required stitches to close a laceration on his left hand, suffered yesterday after a Game 2 loss to the Heat. And the country's top medical experts—people on the internet—are wondering if the lockout-shortened schedule may be to blame. Sixty-six games in four months is just too much for the human body to handle, speculate the same folks who decided that Derrick Rose's and Iman Shumpert's knee injuries were caused by the grind of the schedule, despite the fact that ACL tears aren't wear-and-tear injuries. It's a simple fact of medical science that hands don't just spontaneously lacerate themselves. Some are asking if the schedule, which crammed an extra two games into each month, didn't gradually wear down the collagen in Stoudemire's skin, which could have made him more susceptible to injury, if not caused it altogether. That's the most widely accepted theory, one first put forward by some dude on Twitter who during the lockout was also an expert in labor law. The desire from both players and owners to make up lost revenue may have taken its toll on another superstar, and in the end hurt only the fans. Howard, Lin, Curry, Bogut, Horford, Wade, Bryant, Rose, Shumpert—add Stoudemire to the list of players, who through no fault of their own, will miss important games. Despite the fact that the injury rate over the condensed schedule is no higher than previous seasons, there's no other possible explanation for Stoudemire's injury.